DJR Team Penske has reaffirmed its commitment to V8 Supercars, expanding to two cars for 2016. 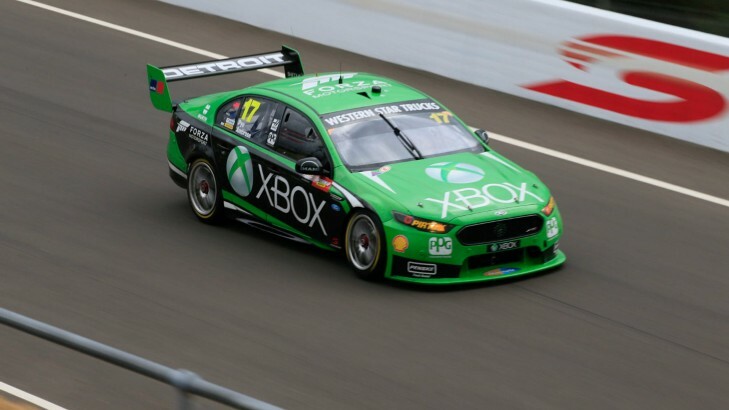 The team today announced drivers Fabian Coulthard and Scott Pye in next year's line-up and revealed the decision to grow to two entries was made on Sunday night after the Supercheap Auto Bathurst 1000. "It certainly shows that we're here to stay," Cindric said of the decision to expand to two cars. "I think there were some questions around how committed we were as an organisation and what our overall plan was, especially when we went back to a one car team where DJR had been a two car team for so long. "There was a lot of, I think, scrutiny on what we were doing. But as we said all along, we feel it's a longer term plan - we want to build a good foundation that is solid in the beginning." The team has been operating with a rotating chassis plan, having a number of race cars on hand, and upgraded the Stapylton workshop for this year's Championship assault. Ultimately commercial reasons kept the team from running a second car this season. "We didn't have a problem having the right equipment, the right number of race cars, knowing we were going to grow into a two car team," he said. "It wasn't a short lived time in which we were going to be here. "We felt like it was the right time [to expand] and the right opportunities with Fabian ... and we'd like to continue to built on the for sure." Running up the front at the year's biggest race, the Supercheap Auto Bathurst 1000, was a huge indicator the team was ready to expand, in Cindric's opinion. "Our decision was really made between Sunday night and Monday and it was really down to what we thought we could do to compete at the front," he said. "We saw on Sunday was we can run up at the front, we just need to race better but we certainly think we're in a position now to go to the next step. "Obviously Roger [Penske, who was not present at Bathurst] had to weigh in on that and see it for himself. "He heard that through the last few events - but to do that on the biggest stage, I think was very important for us to have a good run that weekend. "I think Scott showed we could - every session we were there I think we were at the front of the grid." Cindric praised the direction of V8 Supercars and CEO James Warburton. "We're here because we have business here and racing is the common thread for us, these guys represent us in the right way - it's a home run for us as long as we see progress," he said. "And when I say progress, I mean progress within our own racing team but also progress within the series, and I think we've certainly seen that. "Bathurst was a testament that when you look at the numbers, attendance and enthusiasm that was around that event." Cindric confirmed the team would take back the REC (Racing Entitlement Contract, licence to race) it had leased to Super Black Racing for the second car. Entries for 2016 were brought forward this year, with initial intentions to race required by Friday October 16. "We're submitting the entries today so that's over," Cindric said. "There's a lot of work to be done on [the commercial] front. "The deadline coming forward prompted us to make decisions earlier than we'd like to, to be honest, but at the end of the day it'll be better for us that we did."